Learn How to Knit the Basketweave Scarf from Red Heart! 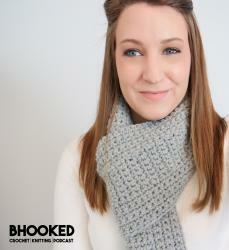 We’ve focused a lot on basic knitting stitches here lately on B.hooked Knitting. That’s because it is so important as a new knitter to learn the basics before trying something more advanced. Once you have a good grasp on the knit, the purl and tension the sky is the limit! This week we’re focusing on a new stitch. This stitch uses the knit and purl that we’ve become so familiar with but it adds in a new element for us to practice and think about. Keeping track of rows and where you are in a pattern repeat is the next essential step to becoming a master knitter! The basket weave stitch used in this beautiful free pattern from Red Heart does just that. It gives you the chance to ease into this new world of reading your knitting. This pattern is the perfect next step! I love this pattern not only because it is great for learning how to count rows and visually keep track of a pattern repeat but also because it uses an amazing new yarn – Super Saver Ombre. I have been waiting for something like this! Unlike some of the other variegated yarns we’re used to, Super Saver Ombre changes colors gradually which creates a soft and subtle color transition. Last week on the Bhooked Podcast, I spoke with Marly Bird, the National Spokesperson for Red Heart and she shared some more information about Super Saver Ombre. If you’re into podcasts, I definitely recommend you have a listen! Now let’s get to this pattern. As I mentioned before, this pattern uses a basket weave stitch to create a beautifully textured scarf that is soft, has a nice drape and shows off that ombre flawlessly. The patter is listed as “easy”, which is just a bit more advanced than some of the beginner patterns we’ve covered here. If you know how to knit and purl, you can definitely make this scarf! This pattern will give you the chance to practice going from knits to purls and back to knits. You’ll learn to keep track of the pattern in terms of rows – it has a 12 row pattern repeat. You’ll also get a lot of experience “reading your knitting” or looking at your work and knowing what row to knit next. It’s like magic! The first few times you work the pattern repeat, you will need to look at the instructions especially for the edge stitches. Once you knit ten inches or so, you’ll have the pattern memorized! Watch my video tutorial to guide you through it. I hope you have as much fun making your scarf as I did. It was so neat to watch the ombre at work! i like this blue knitted shawls i love this pattern, from can i get this?